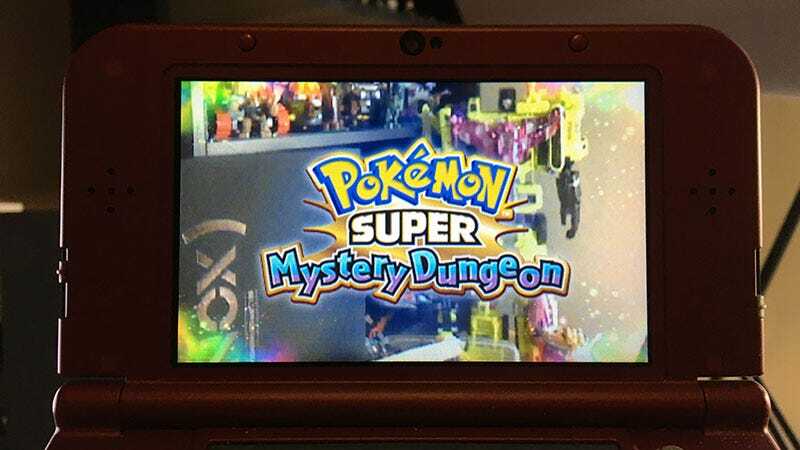 Pokemon Super Mystery Dungeon was released yesterday, and as with all entries in the dungeon crawling series it kicks off with a personality test to determine which Pokemon best suits the player. Let’s see who I am! The game opens on the title screen, which features the logo floating over whatever your 3DS camera is pointed towards at the moment. When I first started the game I was on my back porch with the camera pointed at my foot on the railing. My foot would make an excellent video game. To start the game the player must hold their finger on the touch screen until it’s ready to begin the human-to-pocket monster conversion process. Note to children: Never share your true Pokemon form with sorcerers. It gives them power over you. Now it’s time for the questionnaire. I’ve actually started the process twice—the first time I wasn’t snapping shots—and the questions varied slightly from the first time to the second. Kicking off with a tricky one, as I try my best not to meet people. I suppose if I were to meet a person that I’d want to make friends with I would just make a move, because lingering nearby and hoping senpai notices me increases the danger of meeting more people. Not a big fan. Since telling them both to shut up and then asking them what they are doing in my house is not an option, I am going with the second option—jumping into The Fray. I’d probably start with “Over My Head (Cable Car)” and keep “How To Save A Life” in reserve in case things escalate. If Pokemon Super Mystery Dungeon had done its research it wouldn’t have to ask this question. Snacktaku does not hesitate to try new pastries. This question is missing important information. Where is my point of origin in relation to the school? Am I one of the kids who lives just across the street, or am I being bussed in from another country to help fill its quota of tall bearded men way too old for school? Even if I knew the distance there’d be math involved, and I can’t be bothered. Now I don’t really have many people in my life I’d consider friends, but if I did I’d make sure they were the sort I could easily bend to my will. No, my compatriots—today we Double Dutch. This feels like a very pointed Pokemon question to me. I am surprised they didn’t include several more potential answers, like “The charred remains of last night’s bonfire” or “The ghost of tourists lost at sea”. As I pondered this I realized I was staring off into the sky, so I went with the second option. There are far too many types of music to limit this question to four answers, especially if one of the four choices is EDM. I feel like I should openly and loudly rebel against this one, perhaps get some more piercings and tattoos in protest. So the first option then. The final question involves picking my companion Pokemon. Cool or cute? Those are incredibly basic definitions. I mean, a cute partner can be cool and vice-versa. Ultimate I decided that I didn’t care what my partner looked like as long as they were relatively chill. Cool, daddio. And now for the moment of true—a video game shall judge me. What? Quick to give up? I beg to differ, Pokemon Super Mystery Dungeon. How dare you call me quick to give up? That’s just... aw, forget it. Or I just have issues sticking with any one thing for long because of my biological father. Did I ever tell you he was married five times? Man, I guess I just wish he’d spent some more time with me before moving on to see what was right for him. Wow, Pokemon Super Mystery Dungeon, I never looked at it that way before. OH COME ON ALREADY. It’s not like we’re watching America’s Next Forgotten Model or Chopped here. SPIT IT OUT. Huh. Froakie? Let me consult my Pokedex. A bubbly exterior covering up an overwhelming distrust of just about everything? Why, that’s not me at all. Maybe a little. Shutup. All that’s left now is to determine my partner. And thus the adventures of Water Frog and Fire Monkey begin. Of course players can ditch the test results altogether and just go with whichever Pokemon they want, but where’s the subservience to an arbitrary system based on spurious psychological testing in that? Pokemon Super Mystery Dungeon launched Friday for the 3DS, in case you want to test yourself. To contact the author of this post, check your local lily pad, email fahey@kotaku.com or find him on Twitter@bunnyspatial.